Ty-Coat Park has been in existence a long time, but became the property of the city in 1937. Several years of work were needed before its inauguration on September the 12th, 1943. 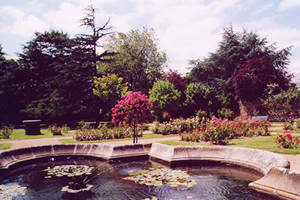 Its magnificent rose garden, counting over 2000 specimens, was opened in 1939. This park's many trees include plane trees, cedar, sequoia, horse-chestnut, tulip and gledischia, giving it an exotic air. Ty-Coat is an intimate park with great charm, at its very best in its maturity. Summer 8 a.m. to 8 p.m.
Winter 8 a.m. to 5 p.m.